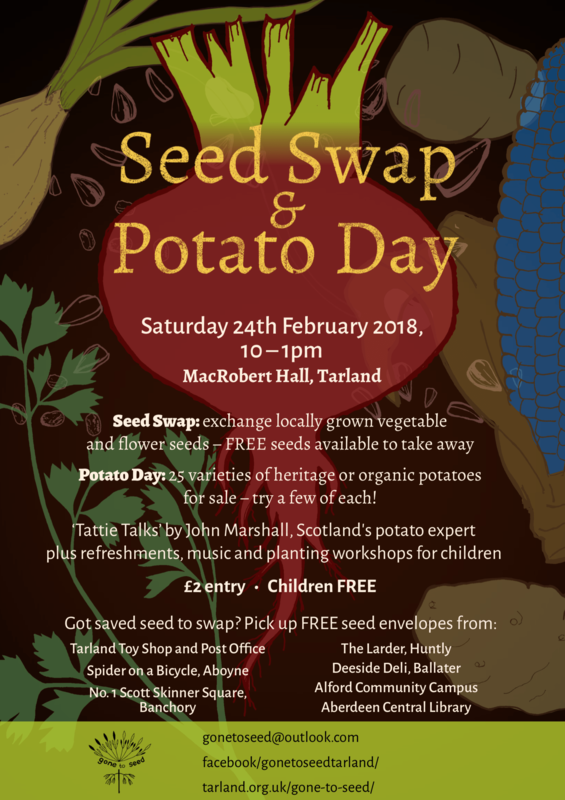 Planning is underway for the Tarland Seed Swap and Potato Day for 2018. Most of the boxes of seed envelopes have now been distributed, so please collect some and bring along your seed to the seed swap. Locations are listed on the poster but there will also be a box of seed envelopes at Cruickshank Gardens. Don’t worry if you have not managed to save seed this year, you can still take some envelopes away and try them out. A real highlight is John Marshall, Scotland Potato expert, who will be giving an introductory talk on “The Potato Story” at 10.30 and then running a workshop on Growing Tips and Diseases, suitable for more experienced gardeners at 12.00. We really look forward to seeing you all there.